So, you've started to read about IoT systems, understand the basics, and are already teeming with ideas on how you could benefit from having your own. But going from Point A to Point B is no easy task, especially considering how complex and sprawling IoT systems can quickly become. Even the most experienced developers and tech-savvy entrepreneurs will have a tough time realising an IoT vision on their own. This is where IoT platforms come into play. Simply put, an IoT platform is a tool for managing IoT systems. IoT systems consist of four primary components: the hardware, the software, the user interface, and the network. Say, for example, you have an army of IoT robots. The hardware consists of the robots and their sensors; the software tells them how to march in single file; a network is what allows them to communicate with each other and you; and the user interface is how you tell them which direction to march in. The problem with managing an IoT system like this army of robots is that the four components making up the system are dependent on one another but managed independently. There's no overarching system in control of these four elements, ensuring that they're communicating the way they're meant to, checking for issues with your bots, or organising the data being gathered. An IoT platform is what connects the four components into a cohesive, manageable, and interpretable system. These platforms help make data ingestion, communication, device management, and application operations a smooth, unified process. Not only that, but IoT platforms give you a framework to build upon, rather than having to create your robot army from the ground up. It makes developing your IoT system faster, easier, and much more practical. Put otherwise: it's the bridge between Point A (a great idea) and Point B (a realised idea). Connectivity platforms are, as the name suggests, centred around the networking component of IoT systems. They provide users with the software, connectivity hardware, and data directing necessary for keeping your devices online. Their networks generally rely on existing carrier services and wifi, configuring the connection in a way that allows for easy IoT set up. Device management platforms specialise in the grunt work involved with IoT devices. They ensure that everything is connected and secure, and keep you updated on the status of your devices. Device management platforms update the firmware, notify you of changes in your devices, report metrics, and patch security. This kind of IoT platform will help you with the routine tasks associated with your devices, no matter how many you have. Cloud platforms provide users with the infrastructure required to create a cohesive IoT system. They're a central location for all of your backend process and data to exist and operate. One of the biggest benefits of cloud platforms is their scalability; regardless of how small you start; a cloud platform can grow with you and your IoT system. Application enablement platforms are a one-size-fits-all approach that offers users everything they need to get an IoT system off the ground. They provide you with the devices, software, development, and deployment of IoT systems. They're a one-stop shop for kickstarting your system, saving you from having to manage developers, network configuration, and hardware engineering yourself. Advanced analytics platforms are a great solution for data-driven IoT systems. Users looking for sophisticated IoT systems that utilise machine learning, artificial intelligence, statistical modelling, and mass data harvesting can use this kind of platform to interpret and act upon the gathered data. IoT systems that primarily work to ingest data, rather than perform tasks, will benefit the most from these platforms. Picking the right IoT platform is extremely important when first starting out. The bigger your IoT system is, the more costly and challenging it will be to migrate to an IoT platform. You not only need to pick the kind of platform that best suits your needs, but also has the reliability and service to keep you supported over time. The most important considerations when picking an IoT platform, aside from deciding on the type of platform that suits your needs, are security, reliability, and ease of use. An IoT platform should streamline your IoT system into an easily manageable, understandable unit. Security is vital as well since your IoT system will be harvesting and transmitting virtual tons of data about your operations. And lastly, reliability. Going with a less expensive IoT platform may save you money in the short term, but if their service is unreliable, you'll see the effects of it reflected in millions of devices. Depending on the complexity of your IoT system, you may end up needing more than one IoT platform to keep things running smoothly. Using a connectivity platform to keep your devices online along with an advanced analytics platform to ingest your collected data can keep a large IoT system from becoming over-encumbered. JT offers NOMAD Managed Connectivity IoT platform that is secure, cost-effective and government-backed. Watch the feature video of JT NOMAD Platform to find out more. 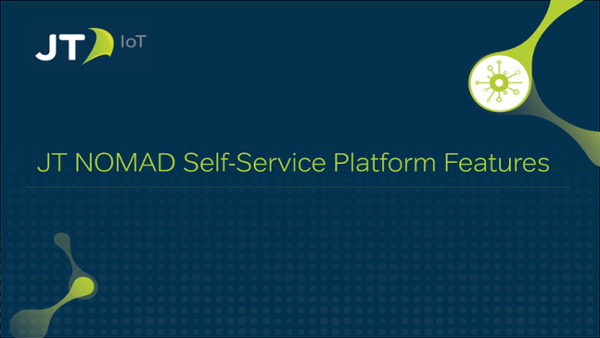 To find out more about how JT NOMAD works, download our self-service platform data sheet here or contact one of our IoT experts.